Skydio is a very special drone company with a thought-provoking inaugural product. R1, the company’s first drone, costs $2,499, is fully autonomous, and it’s marketed mainly to hobbyists. So why does a startup’s initial product, targeted for consumers, have me so excited? Well, the answer is not what their technology is currently capable of, but what it represents for the future of commercial drones. When designing R1, Skydio took a unique philosophical approach to what’s currently available on the market. R1 is different than other drones – it flies itself and doesn’t even come with a controller. 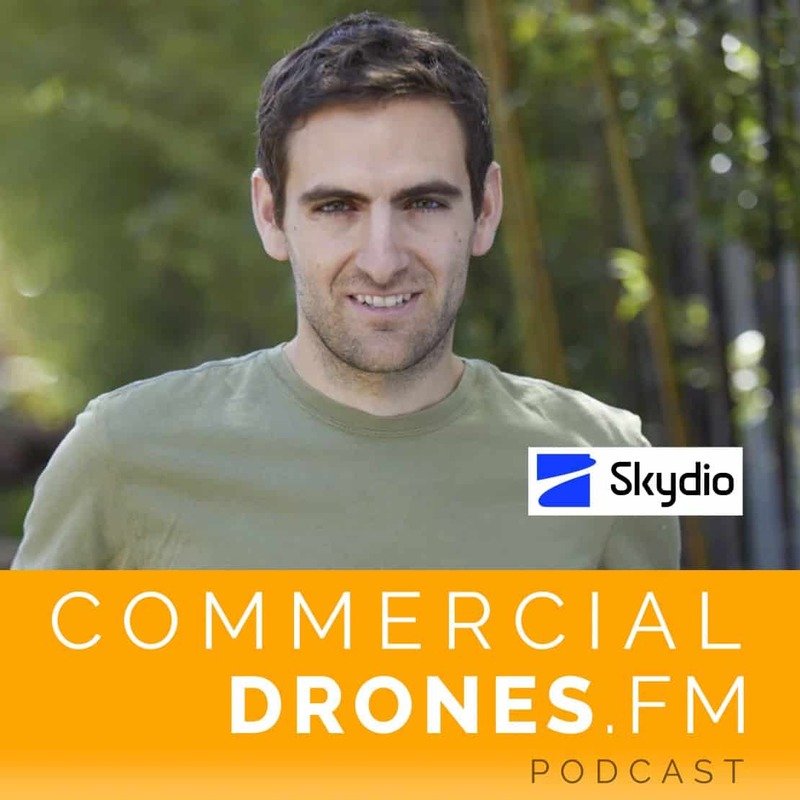 Adam Bry is CEO and co-founder of Skydio. He graduated from MIT, was one of the early team members of Google X’s delivery drone initiative, Project Wing, and then started Skydio. I sat down with Adam to learn about what’s possible right now with the powerful on-board processors and AI that guides Skydio drones, unscathed, through crowded, obstacle-laden environments. We discuss the design inspiration behind R1, a future Skydio platform and SDK, and how commercial drones will continue to evolve. Go here and scroll to the bottom to let Skydio know how you would use their drone technology for commercial applications. [0:52] Hey everybody Ian Smith here and I am sitting in Redwood City at the HQ of skydio with Adam Bry the CEO and co-founder of the company and welcome to the show Adam. [1:03] Thanks and thanks for having me on. [1:05] Thanks for having me at your office it's really cool spot very aviation-themed kind of like a cool Warehouse theme to it as well let's start off with your background so. Tell us a little bit about. Yourself about Adam and your background and how you really kind of got into orchos drone technology and then became the CEO of a company called Skydio. [1:27] Yeah so I've actually been building stuff that flies since I was a little kid so I grew up flying radio-controlled airplanes. And I took it probably way too seriously actually traveled all around the country competing in everybody competitions I did that with my dad. [1:43] To the balsa-wood with the heat shrink and the. [1:46] Yeah yeah the whole thing so I spend a disproportionate amount of time in my youth in the basement sort of slaving over these things putting them together and then and then find them as well. I certainly didn't start doing it because I thought it was you was going to be a career I mean I just love stuff that flew I love the technical challenge of putting them together and then I also really grow to appreciate and love the challenge of learning how to control them and fly them. And that's kind of what got me interested in engineering and then I was fortunate to just be going through engineering school around the time when it was first possible to take computers and sensors and put them essentially on RC airplanes. And and start to write software to make them do things autonomously and that just was totally captivating and addicting to me. So why was a grad student at MIT starting 2009 and really the goal of my Master's project there was to do something that would be impossible for a human pilot to do to build an autonomous system that could do things beyond the capability of the best human Pilots. I'm so the main output of that project was an airplane that can fly itself through the parking garage. [2:51] I saw the insanely cool video about that out how long ago was that video released. [2:57] So that video was 2012. [3:00] Yeah I was 2012 it was it was about a two-and-a-half-year project I mean yeah there are a lot of different aspects of the research and it sort of worked. A year-and-a-half in but it really work two and a half years in which is when we made the video that that got the most most fertile play on on YouTube. [3:17] If it if anyone hasn't seen that it's basically like I'll take the Liberty here to describe it from a Layman's perspective but. It's a fixed-wing drone flying and I can pack parking garage it seems and literally flying around inside of like I don't know how tall the the ceiling was like 10 a 10 ft 12. [3:34] Yes I know it in meters because our lab worked in metric units and we had detailed map to the whole thing so I think is about 3 m or Two and a Half Men floor-to-ceiling. And the the airplane had a 2-meter wingspan so when it was Bank over. Oftentimes you can see this in the video like it was you know 20-30 CM clearance are all these obstacles flying in about 10 meters per second at 25 miles an hour. [3:56] So this is this is something that a human pilot like maybe could do laps maybe once or twice if you're like really talented. [4:03] I think I think not even I mean I so I was I was a pretty good airplane pilot in my day at least I was competing and really the sketchiest part of the whole thing was when I was trying to fly this thing so like sometimes to collect data I would have to fly to run manually. And I crashed a lot doing that to the computer crashed too but I found it I found it basically impossible to do it flying it volume annually. [4:28] That's awesome and so okay so after this then you decided there's there's a business here maybe. Not directly to Scotty oh so you know what the time at MIT and this is where I'm at my co-founders as well at the time in a mighty we just thought the stuff was super interesting and fun and challenging and you know generally it seems like. Autonomous flying stuff had a lot of potential so it was exciting to work on but I was at I would say it was before most people head really seen. A lot of the the business use cases that team exciting today and after a mighty we got the opportunity to go to Google and help start project Wing there which is Google's drone delivery effort. So a band i r c t o is one like her Pounders we were at Google for. You're in a half working on on that project we we left before it went public before they did the first public demo. your first product the R1 which is a fully autonomous flying. Quadcopter that's super badass but you had telephone little bit about skydio Force than just the company in general employees and such. [5:53] Yeah so the basic idea for the company was pretty simple like we. the things that seem most exciting two people were also going to be the ones that didn't work particularly well with manually flown drones and. most of the most interesting valuable exciting drone applications and it was something that wasn't really possible with existing product and I think it was possible in ways that people didn't totally understand like because. so you know for the first almost here it was just three co-founders in a basement writing software off-the-shelf Hardware the company's grown quite a bit since then so we're now. engineering although we do all the building and shipping a product is a significant undertaking and we cover all the bases that it takes to do that now. It's actually a very small team for the ambition of the product that we have. [7:51] Because building it here that the headquarters okay. [7:55] Yes we actually do final assembly in and test ourselves which enables us to ensure super high-quality and it's also enabled us I think too. Just shipped faster than we otherwise would have because we can just. We can iterate so quickly like if there's an issue on the line the software engineer who's working on that component can go and inspect it diagnosis debug and fix it in a way that. You know what it takes a lot longer if you're if you're trying to do it overseas. yeah it's got 360-degree obstacle avoidance 4k camera autonomous flight built-in hard drive for storing media and such. What else is going on like under the hood you know what what is it there's there's like a bunch of cameras on this thing and tell us a little bit about that. [8:48] So I think the starting point is there's kind of a philosophical difference and how it was designed and built from other products that are out there. And basically what I would say is that we think of it more as a flying computer than as an RC quadcopter so I think most of what you can buy today still kind of has its roots in this radio-controlled quadcopter. Paradigm I really would come from RC helicopters and RC airplanes which I think has some obvious and some subtle. Implications for the hardware and the software. So on our side with R1 you know thinking of it as applying computer and something that you want to be fully autonomous that means that you need omnidirectional sensing like if you want to be able to trust it supplied self and you wanted to be able to fly in any direction need to be able to see in every direction I think that's just sort of like. And I'll be starting point but it's not something you obviously us but he was not something that like exist out there otherwise today and then you need a really powerful Central Computer you know those are sort of the back bones. [9:49] Of all the Computing devices that we use and benefit from on a daily basis so our one is built around an Nvidia tx1 I was just a super powerful CPU GPU combination. [10:02] Yeah yeah part of the Jetson family. And that enables us to leverage you know all the Cutting Edge Frame Works in deep learning and computer vision. That are that are out there and and really you know build a super powerful offline autonomous system. you know three people three co-founders in a garage kind of phase where you were just testing and iterating and it'll probably a super quick rate just 24 hours a day. [10:55] Yeah so you know overall I would say the. It's it's taken us I think unsurprisingly for like a hardware startup it's taking us a little bit longer than we thought to launch the first product but the other thing I would say is that the capabilities and the level of robustness and maturity in the autonomy is really. Beyond what we thought it was going to be in the first product and I think that. Were you no Testament first of all to the team that built it and I'm fortunate to just have an incredible group of people here spanning software and hardware and all the different disciplines it takes to put these things together but I think they were also fortunate. To be just doing it at the right time we're riding these friends and computer vision and deep learning and the hardware to support that stuff and I also think that there's this. This relatively new phenomenon where historically most cutting-edge robots are built in academic labs. manage this off-the-shelf hardware and hack it to get it to do what you want but really you want to be focusing on the flight software in the algorithms but in order to demonstrate the robot thing you're doing you have to. Design and build the whole thing if it crashes you spend a week fixing it and it's really like pretty slow going and. That's why you go we're fortunate to just have a world-class team of people across hardware and software and embedded infrastructure and like all the things that it takes to build one of these systems. And on the autonomy side we have literally like World experts in 3D geometry computer vision deep learning motion planning control. [12:26] And each of them is working towards the common goal of what the system is capable of and the maturity and sophistication of each of those system disorder. Reinforces all the other ones as well like when you have when you're doing really good motion planning and really good computer vision side-by-side they they both benefit each other and so I think that. [12:46] All of those ingredients together has been has been pretty fun to see what what you can do and I think that it's accelerating is not slowing down like. Yo I feel I have the longer you on this cuz I've been around since beginning when I was just three co-founders in the basement like the pace at which were getting data back. AR level of understanding of the physical challenges. And our ability as a team to like build stuff quickly that improves capabilities and adds new features and stuff is is getting better and faster and so I think it's like it's just a really exciting thing to get to be a part of. The other thing I was saying you kind of alluded to this you know when it's three co-founders iterating on this stuff. You know one of the sword methodologies that I think we've adopted or I would say adapted to. which little people taking a lot of different directions but it's basically like you want to ship your Mbps passes as fast as possible and learn from customers and I think there's. A lot of you know there's a lot of benefit to that way of thinking but it doesn't necessarily apply. To all systems I think in robotic systems one of the sort of adaptations we made is that you sort of have to think of the real world as a customer and so we made a long time because it. You Know You're Building Systems that interact with the real world and has to deal with real physics and perceive things and so you know one of the things that we've sort of embedded in our development process is. [14:20] You want to be iterative in that respective like what's the simplest algorithm we could use to accomplish whatever I'm trying to accomplish get out there and fly tested look at the data see what's working and what's not. And I swear to look at it to you you have these two two masters that you have to please like reality in physics and then the actual customer and user of the product. And you have to have like an iterative mindset with respect to both. [14:44] What is your purchase is fascinating this is really cool perspective that I don't think we've had on on the podcast before and I'm really excited to dig into some of the potential commercial applications. Before we get to that part of it you know on how to apply your technology commercially. I just a minor detail that I noticed I'm not sure how many other is noticed this for some reason I guess it's just my Aviation background with rotary aircraft but I noticed you guys have a 6 bladed rotor design to each. Each rotor in each Motors attached to a 6 bladed rotor as opposed to like the traditional what you see on these quadcopters these days you know it's like industrial-grade Etc. They usually have a two-bladed rotor designed like that. Like a standard helicopter in most cases. What's the reasoning behind this is there am I looking too much into this or did you guys do testing that was like okay this is air dynamically more efficient maybe we'll get more battery life or it's quieter what's what's going on there. [15:42] Yes it was it was definitely a very intentional engineering trade-off and I think that it it just has to do with the specifics of our form factor. So we have these perimeter carbon fiber blade art structures. That go all the way around the device which hold the stereo camera is the T in every direction and so having those what's the cameras in this totally unobstructed view where you can see everything in every direction. And then they also protect the propellers but in doing that they they put a little bit of pressure on the disorder diameter that you can have. And so it puts More Design pressure on like how much lift can we cram into a smaller area and. If you were willing to spend the thing super fast and make a bunch of noise you would be slightly more efficient with the two bladed propeller but the more blades basically like more surface area you have in there this lower you can spend for the quieter it's going to be. So we did a lot of investigation and we actually studied it from a few different angles there's just a pure metric efficiency and then there's also the sort of subjective not just the magnitude of the noise but. Keep the way people perceive it and so we did a fair amount of sound studies around that and picked a propeller design that was almost as efficient as the optimal thing would be. But significantly quieter and and more pleasing to listen to. [17:06] I just have to say I'm very proud of that question that was a good question that I just came up with but tub no honestly I like drones. [17:16] Turn noise is it's very disturbing and it's one of the one of the hurdles to like Mass adoption I can mean. You know you can't just imagine who there was a study like NASA to study someone some of the study that like the noise of a drone is like more annoying than anything or something they compared it to something supermundane like the sound of just like a car going down the road at the same. Same frequency I don't know if I'm using the term correctly but basically the Drone sounded like grading to the years and kind of annoying and so yes I'm looking at a very glad you guys thought so much into that did sound testing too because I think that's a big. Fertilize as we move forward as an industry in the future. [17:57] Yeah I totally agree and I think I mean I think we'll come back to this but I think that you know it affects size wait noise all come together and that affects our sort of view of the commercial landscape as well. [18:09] So the price of this drone that's something that. You know I look at the internet comments and everyone's like oh it's so cool but oh my God it's so expensive they're never going to sell any of these things. [18:23] Probably purposeful if I'm not mistaken I mean you guys price this psych knowingly like. Is there as early as strategy right now if you want to limit the demand a little bit with this you know it's your first Hardware product it's the initial thing it's kind of nice you know it's it's very powerful what's the story behind the pricing. [18:41] Sure so I think the right way to think about this is It's analogous to other kind of first-generation compute devices so. There is a lot of Technology packed into R1 to make it possible like the goal of it is not to pack in as much technology is possible as to deliver this breakthrough autonomous flying experience which enables all these cool things for our customers. But in order to do that we had to do a ton of R&D and we have there's just a lot of from a hardware standpoint there's a lot of stuff in there so. And I think that's you know that's just the reality of of doing these like new challenging ambitious products of the first time like if you go back through the history of personal computers I think this applies to Tesla to some extent like they had to. [19:26] Build these lower volume more expensive cars in order to figure out how to build higher-volume cheaper ones. And I think that all of those Dynamics are in play for us and the other thing I would say is that it's. Do people like to compare it to other drones but I think in a lot of ways that just kind of a non sequitur comparison for most use cases because the way that you use it and the kinds of things that it can do are just completely different. And and you know the fact that it has I understand where I come from like it has four propellers and it has cameras on it so it looks like a drone you know it is. It's a drought I'll be just very different from the other stuff that's out there and I think. You know it's it's clearly at a price point where it's not like a mass-market mainstream thing but it has a. We feel in our first customers would agree like it has a pretty amazing value proposition for what it can do where it really is like a.
you know it's probably not yet for everybody but we think that it does something pretty special for the people that. You know have a have a use case that fits. [20:44] Speaking of the you mentioned that you have to think about the way people use it so the interface. If the Drone of course is like the mobile app that you guys have there's a software approach to this and what was your what was your feeling hearing with this very highly autonomous. Aircraft that can go fly pretty much anywhere what's the like what's the user experience what's the approach of how I interact with one of these. Caveat here I have not flown one yet so I'm hoping before I leave maybe I can take one for a spin and try to crash it as I see everyone try to do and failed miserably. [21:20] Yeah we just like that. [21:21] But yeah little bit about the softer approach and how you guys thought about that and what you see moving forward. [21:29] Yes or couple things about the software I think the the starting point for us and thinking through the whole user experience which is most directly reflected in the mobile app. Is that it should match our expectations of how we interact with our phones normally and other kinds of modern technology devices so in particular. You know we we draw a lot of inspiration from just the camera app on your phone and I major design goes like if you're comfortable using the camera app on your phone you should be comfortable using are one which. It's only really possible with super Advanced autonomy on board like. I'm for us a lot more of that is it taken. Being taken care of by the onboard software and so you can interact with it at much higher level of abstraction of like here's where I want you to be here so I want you to move relative to me here's what I want to look at. And then and then it does the rest and then the other thing that I would say is that. If you're not going to have somebody manually flying it or at least that's not the the dominant mode that the products can be used in then. The it basically becomes a software to find experience like the way the drum behaves how it reacts to what's rounded how that information gets exposed to the user. Is all done through software and it's all very flexible depending on how that software is written in and what the application needs are. [23:05] I'm and we think in the meeting long-term that's a really exciting thing because there's a potential to just automate. [23:13] A lot of different kinds of things that people might want to do four different kinds of tasks through software. [23:18] So we're going to get to like I'm really excited to get to the commercial applications part but that brings up. One of the questions I wanted to ask you know since the Drone is kind of like not exposing all this information or at least the software. To the the user quote on quote I'm not sure what to call them in this case. there's a lot of and I'm sure this is it's a really tough question to it's a truly answer because we don't industry we don't really quite know completely yet. Does have parallels to the autonomous car industry and in these kinds of things self-driving cars but what are your thoughts on this how does this does this work. and use case basically ensure that it's always going to be within Visual line-of-sight and it also is not going to be flying high it's unlikely to interfere with men aircraft. Swinging from a regulatory perspective. With our one we're in like a very kind of safe place and actually pose fewer questions and risks and challenges than a lot of the things that are sort of most concerning about the other. Public Safety risks of the way people talk to use drones today in particular interaction with manned aircraft you know I think the the medium in the long-term answer. Eventually even better which is that I think autonomy is potentially one of the keys of. Basically encouraging or enforcing responsible use like if the thing is flying itself it's very easy. To ensure that it's going to fly itself in a safe reliable way. [25:31] He can program the Drone to have like not break any rules. [25:35] Yeah exactly and you know our hope is that this can be one of the things over time that. Kind of opens up public perception around these things a little bit the drones go from being. You know the unreliable thing that my neighbor uses to like spy on me to just use like crusted elegant intelligent flying machines that that always do the right thing and that are are useful in in whatever they're doing. run into person's face or car or you know we hit tree or Powerline or something like do you foresee certification as like kind of a.
I would even say it like a challenge it's going to be I think it's going to be a milestone maybe for for a company like you guys. [26:39] Yeah I think it's a milestone I think it's an opportunity for Austin and really for the industry as a whole and you know I think it probably is likely that things like that will exist at some point it's it's a challenging thing. I took codify in some cases but you know the initial steps that we've seen the fa take I think I've been pretty positive and. Basically what I was saying I think the. [27:04] My son's based on what they've done is that they're thinking this way to is that you wanted to be based on data and you wanted to be based on sort of like quantifiable test that can be done like. Though I think the wrong way to go about it would be to try to certify the software are priori based on sort of static checking and things like that because it takes. Incredibly complex software systems to deliver like trustworthy autonomous flight. And I think that you're much better off certifying based on the outputs of that system like how it behaves in different scenarios what it's capable of candid meet certain criteria than trying to certify from the inside out but I think that they get that. And I think there's a pretty close analogy to self-driving cars there as well and so yeah I think they were probably a few years away from that. A real possibility but I'm optimistic that at some point will be there in that it'll be it'll be good thing for the industry I mean I think ultimately anything that encourages responsible use. And give us Everyday People drone users are not sort of peace of mind that these things are going to behave intelligently and responsibly is is going to be a good thing for the industry. [28:14] So are one is by all for all intents and purposes at this point in time a. [28:22] Consumer product like that's how I view it that's how I believe it's marketed I don't know if you would disagree with that. Now let's get to be exciting commercial stuff this is commercial drones FM you know what what kind of applications and what is your view. Two long-term on how Sky do technology you know you guys could license your technology and me there's like a software there's an algorithmic component of this you could build your own Hardware you could do software I mean. What kind of thoughts and where do you feel that this super highly autonomous technology do you guys have been building in released. Can be applied to commercial scenarios that we are going to do save businesses money or increase productivity what can you tell us about that. [29:09] Yes you probably wouldn't be surprised to know that we're incredibly optimistic about this and our. In our core belief is I said it is basically that autonomy is one of the keys to making drones useful potential across every application and you know we view is. We view commercial opportunities is a huge part of that in the long-term potentially the the bulk of that and if you look at what's. In the commercial space most of it is for the built on this Paradigm of it being a low-flying satellite where the Drone is flying high overhead it's above all the structures around it it's relying on GPS and doing GPS Waypoint following and even so. You still need to have a person there to watch it to make sure nothing messes up to man is Takeoff and Landing. And I think that we will look back on this is really the super primitive early days of drone use in the commercial space. And autonomy is the thing that you. [30:11] What all commercial use essentially revolves around is capturing data that you wouldn't otherwise be able to get in some form either doing it more efficiently or enabling data capture that you. [30:22] You can otherwise see if everything except delivery I should say which is sort of the tone specialized thing. And yeah we think Tommy is really the key to making that a scalable reliable trustworthy saying where you can push a button and deploy one drone or a fleet of drones or you don't even push the button it's all automated in software and so that's definitely. You have a future that. [30:44] We're building towards and I think our one is a significant step in that direction so I mentioned this earlier like. It very much is a soft word to find experience and. The software that we're shipping and marketing currently is oriented towards this like autonomous capture thing which is amazing and pool and. We're seeing a lot of incredibly exciting stuff happened there it's a product that is not even imagine but hasn't been made real. We do like until until the Arbonne existed but we think that there are. A bunch of other software to find experiences for different applications which are also incredibly exciting and cool and I think one of the one of my overall most optimistic data points on drones as general is that. This still happens today even though I'm doing it for last 4 years like. I'll talk to somebody and they'll propose an idea for something that like I never thought of before for what you could do with a drone and I think most of those things over time are going to come real. It's just going to take a sort of foundation of autonomy and then creative software developers around and on top of that. To Able them until that's definitely a future that that we feel like we can be a big part of of enabling. [31:59] I like that too whenever someone comes up with something you totally just never thought of it it's like what the what and I think about that it's really cool. [32:10] Do you guys have any like specific maybe like things eczema mentioned okay right now the drones are kind of like hovering they're like above everything or above your head there. Doing remote sensing from a significantly you know in the grand scheme of how drones can go really close to things a far distance. So you know future skydio product maybe it's something that's going to be like right up next to a I don't know. Powerline pipeline wind turbine something that's just literally using its on-board sensors and computer vision to get super super close to like the most minoot detail and just like Dive Right In and maybe even do. Onboard processing so it does like a you know quick pass over the whole thing to get like a macro View and then it goes micro to inspect like some Rust through like a crack that it's all I mean is this kind of like in line with what you guys are thinking. [33:01] Yeah definitely but I think you're you're hitting a lot of the stuff right on the first thing is that. You know navigation should just be taken for granted like you should be able to trust that the thing is going to fly itself in close quarters it's not going to like fly away if it loses its GPS signal. It's not going to bump into anything like I think that's just a fundamental Baseline capability. Didn't really exist before our one that is a necessary building block for a lot of these things to make sense and then on top of that. You pair the capability to respond in real-time to what you see. And I think that you get to some pretty powerful places because you can you can do the things that you would do if you had like an expert operator or Pilot or photographer that they are doing whatever the task is so. You know the stuff that you're mentioning and you know you can list off any sort of infrastructure but just getting in close to structure seeing what's actually happening. I'm capturing and high resolution in in a seamless safe reliable way just that capability alone. I think of something that doesn't exist in a reliable scale away and can have a huge impact across across a bunch of different Industries. can work indoors if I'm not mistaken like zero GPS. [34:37] Yeah so what the product has GPS on on it it can use it if it's available but it can fly completely independently so I can totally fly indoors you can find confined spaces and. I can't say too much in detail about this book like we had some notion that we thought places where this could be useful and since we launched. [34:55] We got into a huge amount of inbound interest for different kinds of things that could be done like this and yeah I mean we think it's I think it's pretty cool and something that were in a kind of position. To be able to deliver I would say the fundamental capability. Again excluding delivery but the fundamental capability if you think about it it's just sort of automating access to the physical world in real-time like being able to put a sensor wherever you want whenever you want. In reliable trustworthy way which at maturity yeah I mean there's there very few limits to to what you can do there. [35:33] Yeah I'm in everything so fixated on cameras on cameras take pictures of thick videos but like you said it could be any kind of sensor. I guess that's half of your camera that's one of the things that mean in the past 5 years I've been in in drones or I don't even know how long it's been now but it's just camera camera camera so really excited you have drone deliveries cool cuz it's not just like. Using a camera to do something it's like moving something from point A to point B. [35:58] Yeah and I would even say that is like some form of automating access to the physical world like it's basically you can move things around programmatically in reality using software like that's what drones enable. [36:09] As far as are you guys. Planning on potentially opening up some type of SDK or way that maybe I'm a developer listening to this podcast from another company this technology sounds super interesting and I can build on top of it potentially what are your plans as far as a.
Skydio are one or just any future product as a platform. [36:30] So I think it's almost a no-brainer because there's so many there so many different cool things that you can do with it there's just no way. You know officer anyone or anyone company is going to do a good job building all of them. do real time perception of what you see like these things are broadly useful they're useful for filming the football game in there also useful for inspecting a wind turbine. And so I think it just it sort of Screams out flat platform kind of Dynamics and so. [37:13] Yeah so you know this is been part of our our vision from the beginning and I can't say anything specific today other than we think it's a real thing we think it's important. The other thing I would say around that though which is also informed our strategies that we think it's important to have. A product that stands on its own even without you no applications or whatever running on top I think most successful platforms. Have that attribute were you know it might only be realizing. Some percentage of its potential but it can do useful cool things for some users on its own and that consumer get the flywheel going of like people use it and play with it in our case like we get feedback and data back and we can improve it. And then we can start to open up the capabilities for other people to use and extend in different ways. but what else I mean are you excited for just in general you know looking forward. I heard about skydio probably when you guys finally went public with what you hey we're building this really cool autonomous thing. Stay tuned and like that was like a couple years ago or something I might be messing up the timeline but what are you excited too excited for as you just looking forward for. You know that after having lunch to our one and you're more people people are getting in their hands they're talking about it. [38:47] Yeah I'm in the really exciting thing to me is that I think we're we're still you know we're still close to the beginning like we're still close to the beginning of what's physically possible. With these products there still a huge Headroom in the software to improve things and make for an even better or smarter more seamless experience there's. Even with what's out there today we we haven't really scratched the surface of applications because in order to develop applications on existing products you the application developers still sort of needs to think like a pilot. And really the application developer should be thinking more like the writing a video game or something like they're just moving around this this virtual sensor platform. And they don't have to worry about taking care of any of the stuff that the pilot we need to take care of that's all taken care of by the by the platform itself and so I think that were just like. Or write it at the beginning and there's. There's just exciting stuff in every direction so you know that's kind of a vague answer but that's what that's really how we feel about it and. You know it's exciting I think the other thing and this is maybe just a little bit more tack philosophical in general I think that. it's worth pulling back from the physical world it's like AR & VR and just like getting the screen closer to your face so you don't have to interact with reality and there's a lot of cool stuff in there. a lot of people inside the company say this like a lot of people here have been a lot more active since they started using are probably because it's just like all like what am I going to do this weekend I'm going to go do some like fun outdoor thing that I can like test R1 and get some cool footage. [40:46] And you know I hope and I think that that's a that's a real thing that that will continue at least 4 for some use cases. [40:55] Walmarts in you guys super closely I'm really really excited for what you guys. Come out with next and how this is going to affect the commercial industry the commercial side and Industrial side of drones so if you're listening and you're interested in extending skydio zar1 for commercial applications go to sky.com. And scroll down to the bottom and then there's a build on R1 modules and you can check that out leave some feedback over there on kind of like how you would use our one for commercial purposes is that correct. [41:31] Yeah I mean we're basically just looking to capture interest from people because you know as I said this is this is something that. We're interested in we are going to do and so you know that's worth of the way for people to be first in line to like you're about it and that's a real thing like I read. [41:50] Read what people write their minute peanut affects the way we think about what order we should do things in. [41:56] Awesome so that's skydio. Come / technology Adam Bree CEO co-founder of skydio thank you so much for for having me hosting me here thank you for being on the podcast I'm really excited to go fly that are one now. [42:11] Alright sounds good thanks again. [42:13] Alright everyone we're going to cut off the mics cheers.